The dock is within walking distance of town. Larger ships will use the port tenders to bring the passengers ashore. Galway is a perfect base for seeing the West Ireland, but it is also worth a visit in itself. Although it has only a few typical sightseeing spots what makes it a wonderful place to stay is the atmosphere, the culture, the people, the events. The pedestrian shopping area south of Eyre Square, is a pleasant place to walk around. And if the traditional Irish rain starts, just visit the Eyre Square shopping center, where they have put a roof above parts of the old town wall and so included them into the shopping mall, a beautiful combination of old and new. Galway is the ideal base for trips throughout western Ireland. Hiring a car is a good way to see attractions in the surrounding area. Alternately, day tours of The Burren and the Cliffs of Moher, and of Connemara are available at the tourist office. The main shopping area runs south from Eyre Square towards the Corrib. This pedestrian zone includes Williams Street, Shop Street, High Street, Mainguard Street and Quay Street. Along it you can find all kinds of shops, pubs and restaurants. 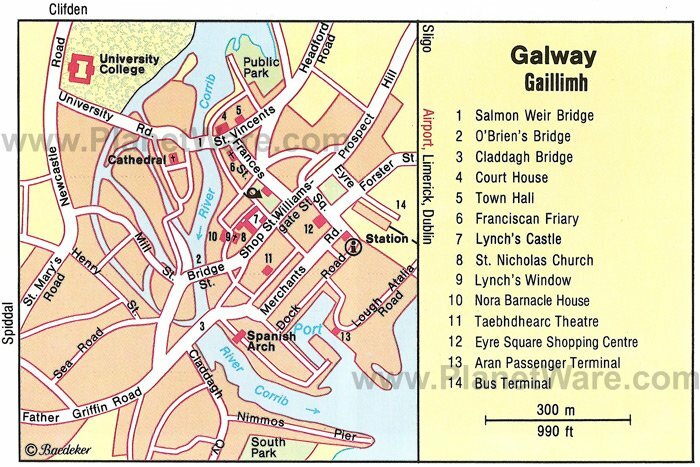 The historical buildings and busy atmosphere also make this area one of the attractions of Galway. Discover Middle Street, which runs parallel to Shop Street, and is the location of a range of inspiring and creative local enterprises. You will find the Irish speaking Theater "An Taibhearc" across from the designer studio "cocoon", along with Charlie Byrne's bookstore, Kenny's gallery and a Japanese restaurant to make an interesting spectrum. Eyre Square center is a modern shopping center almost entirely hidden behind historical facades. Entrances can be found on the south side of Eyre Square and on Williams Street.